Energy Vendor IQ, powered by E Source, is the source for utilities to simplify their vendor selection process. It contains in-depth profiles of vendors in the energy world, enabling users to ensure they select the right vendor for the job by identifying vendors’ qualifications and credentials. Users can see vendors’ service category specialties and basic information, plus client lists, examples of work they’ve done, the regions they’ve worked in, and more to find the vendor best suited for their needs. The energy vendors in our directory are categorized by the type of work they do. Our research pinpointed 46 service categories, which we organized into nine top-level buckets so that they’re easy to find. If you know the kind of work you need a vendor for, the category selection will be the easiest place to start narrowing down to who’s right for you. Choose a category on the home page (via the dropdown menus or at bottom left), or by clicking Find a Vendor > By category. Vendors in our directory are also categorized by the markets they serve. At minimum, the home office state of a vendor is listed; verified, Enhanced, and Premium vendors can also choose to list larger regions served. We recommend coupling a location search with a category search for best results. Choose a market on the home page (via the dropdown menu) or by clicking Find a Vendor > By category. If you already know the vendor you’re looking for, check out our alphabetical listing by name. Access it at the bottom right of the home page or by clicking Find a Vendor > A to Z listing. You can also search using key words by clicking Find a Vendor > Search. We’d love to have your listing in Energy Vendor IQ! We have three levels of membership: Basic, Enhanced, and Premium. A Basic listing is free to add; Enhanced and Premium listings are by subscription. You can check out our listing levels on the Add a Listing page to see what they offer. When you know which level of listing you want, just click the Add a Listing button at the top right of every page in Energy Vendor IQ. You can add your basic information on that form; if you’re interested in an Enhanced or Premium listing, we’ll contact you to get more information. When we launched Energy Vendor IQ, we set E Source staff to searching out energy vendors across the US and Canada. 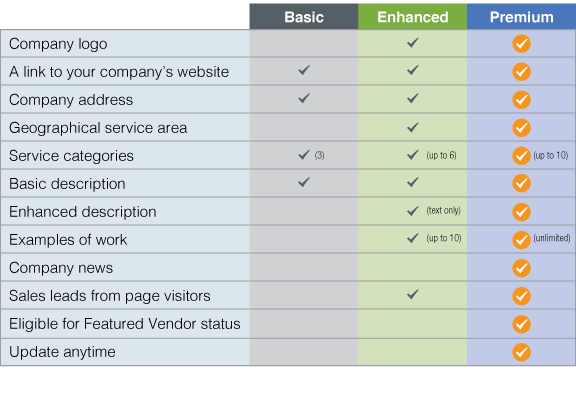 We erred on the side of inclusion, figuring that—as with any directory—customers can’t find you if you’re not listed, so we included basic information for any vendors we found. If you’d like to review and edit your basic listing, we welcome that feedback! Find your listing in the directory, and click the link in the Verify Your Listing box on the right. Within 10 business days, we’ll make any changes you request that fall within your listing level and mark your listing as verified so that your potential customers know that you’re paying attention. If you’d like to include more information about your company in your listing, you can upgrade to our Enhanced or Premium listings. For a fee, you can add a more in-depth description of your company, more service categories and markets served, and examples of your work—we’ll even give potential customers an easy way to contact you and track the number of sales opportunities you get from our directory. If you’re interested in upgrading, you can do that as you verify your existing listing. Just click the link in the Verify Your Listing box on the right—we’ll update your free listing and contact you with details about how to upgrade. If you see something in your listing or that of another vendor that doesn’t seem right, we want to know about it! Click the “Contact us” link, either in the Report an Error box or at the top of the page, and tell us what you see. We’ll do our best to verify any errors that are found.